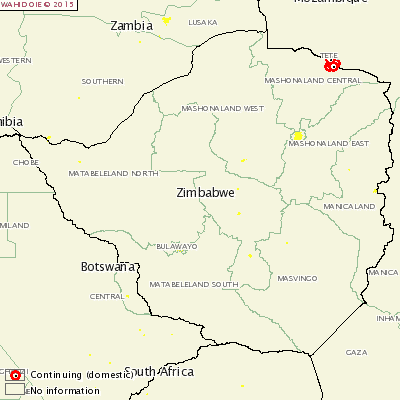 ZIMBABWE - Five new outbreaks of African Swine Fever (ASF) have been reported in village pig operations. The villages all have free-range pigs of varying age groups and are located on the boarder with Mozambique. In total, 649 cases were reported. Infection is still confined to the Dande valley communal area, along the Mozambican border with local spread due to movement of infected animals and meat. Salvage slaughter of infected pigs and selling of the pork at discount prices and movement of pigs from one village to the nearby villages to save them have been the major routes of spread. Poor carcass disposal has also contributed to the spread. The infected areas have been placed under quarantine and movement of pigs and pig products out of the area is not allowed. A 24 hour roadblock with veterinary and police personnel has been set up at a strategic point along the only major outlet road from the valley to prevent infection from moving out of the valley. Awareness campaigns in the infected areas and adjacent villages are on-going. These are stressing the need to confine pigs, proper disposal carcasses by burning and burying and discouraging the trade of infected meat. Although villagers are prepared to confine their pigs in pens their major challenge if provision of feed to the penned pigs as the majority of farmers are poor.